I was looking forward to reading this book and it delivered. An epic fantasy full of memorable characters and an ending you will not be expecting. I found myself reading though this story page after page till the end. Great story from start to finish and kept my interest all the way thru the book. A good read for the young teen and also interesting for an adult read too. I will surely be giving a copy to my teen son to read as part of his required reading list. 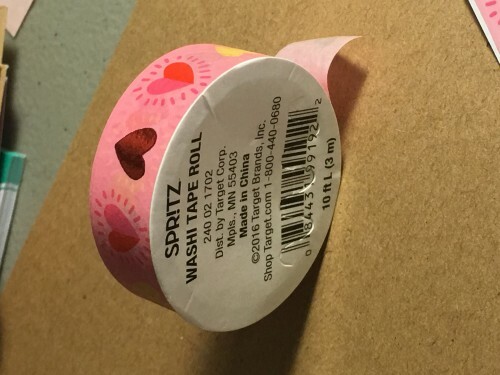 I tried this Target Dollar Spot washi and it had totally no tackiness to it. Most at least hold up ok to paper this one kept lifting up and coming off completely. Not sure what it will be good for, will have to find a way to use it up. I have two rolls of it and it is very pretty to me. Pocket letters were fun, but took so much of my time to put together. I have long since stopped making them though I did get better at putting them together. I am going to try my hand at flip books but not as part of a swap just send them randomly to pen friends. Will get back on how this works out for me soon. I have been away from blogging for a bit but now I am back. Ready to share on a more regular basis. Found this free book for my kindle on Amazon. Started reading the first few pages last night.